Everton boss Ronald Koeman insists he will see out his three-year deal despite admitting he would love to manage Barcelona one day. He is in the first season of his contract at Goodison Park, having arrived from Southampton last summer. The 54-year-old has told Catalan newspaper Sport that he dreams of coaching former club Barca. But on Thursday, he said: "There's no chance that I will leave Everton before the end of my contract." Koeman has been linked with a return to the Nou Camp after Luis Enrique said he was stepping down at the end of the season. "I don't see me being the next manager," he added. "I mentioned several times it's human ambition - for players, for managers. That doesn't change my position or contract with Everton. I'm really happy, I'm looking forward to next season." In the newspaper interview, former defender Koeman - who spent six years at the Spanish club from 1989 to 1995 - said he was committed to getting Everton into the Champions League. "I feel flattered and I like that they think about me," the Dutchman said. "Everyone knows I'm Barca, they know my love for the club where I grew up as a player and a person. "In my life as a professional coach, I have two dreams to fulfil. One, to coach my national team, Holland. I could have done it but my obligation to Everton prevented me. My other wish, my other dream, is to one day coach Barca. That's the truth." Everton are seventh in the Premier League with three games remaining and look certain to miss out on a Champions League place this year. 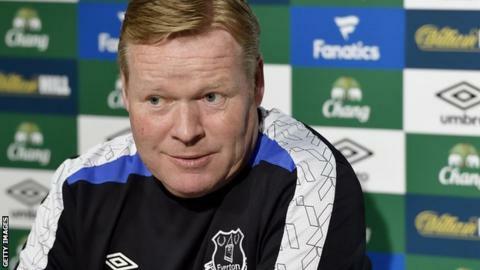 "We have a very powerful and exciting project and we're going to strengthen as best as possible to try and reach the Champions League next season," Koeman said. Asked what he would do if Barca called, he replied: "That's a hypothesis we cannot go into too much. In football, like in life, like in business, you can talk and discuss everything." Meanwhile, Koeman said that striker Arouna Kone will leave the Toffees at the end of the season. The 33-year-old Ivory Coast striker was signed from Wigan Athletic in 2013 after Everton met a £6m release cause.